Five Reasons You Shouldn't Plant a Tree Too Close to Your Home | Mr. Tree, Inc. Your home is a special place, an oasis for you to relax and be yourself. 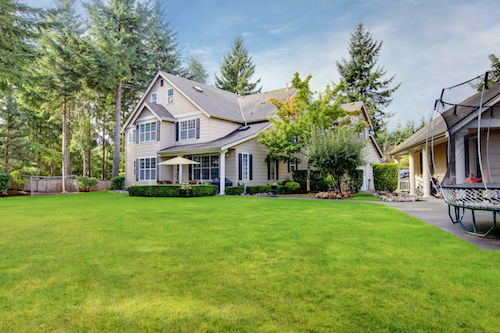 Your yard plays a critical part in creating a calm, welcoming atmosphere. The right combination of shrubs, plants, flowers, and trees can create a beautiful environment that beckons people outside to appreciate nature. If your yard is a bit of a blank slate and you are looking to plant some new things to enjoy for the rest of summer, now is a great time to do just that. Arborists in Portland, Oregon—especially our team at Mr. Tree—know first-hand the beauty that the right tree can bring to a space. We can help you with tree care, maintenance, and provide the necessary information on different trees, including why it is important to plant it in the right place. Speaking of the right place, the wrong place is just as important. This is why you should not plant a tree too close to your home. The Pacific Northwest is no stranger to stormy, rainy days. With the rain, there is usually plenty of wind and with that comes lots of twigs and leaf build up around the yard. If your tree is planted too close to the yard, twigs and leaves that are blown away during weather events will begin accumulating on your roof and in your gutters. Gutters full of leaves or twigs can cause roof or siding damage. Having the tree planted the right distance away will also minimize the hours you spend climbing up the ladder to clean out the gutters. When you are researching which tree you should plant, you will soon find out that there are hundreds of different varieties of gorgeous trees to choose from. Once you’ve narrowed down your top choices, look closely at how big the tree will get over time and consider how the roots will grow. A tree’s root system is complex. Roots that grow and get near a foundation or a utility line will exert pressure against it and could cause serious damage. A tree that is decades of years old will have deep roots and those roots could push into the foundation of your home and cause it to become unsteady or crack in a way that could risk the structure’s integrity. This could be a very serious and even potentially deadly consequence of planting a tree too close to a house. Elms and they should be planted far away from foundations, water pipes, sidewalks, and septic lines. If you do not have adequate space for a tree to grow to this size, consider trees that are smaller or figure out a different landscaping option that could work better for the area. If you’re concerned about tree roots that already exist in your yard, one way to address the problem is to build a root barrier. This requires digging to the bottom of your home’s foundation and cutting away roots that are getting close to your foundation. You don’t have to start cutting down trees if you’re concerned about invasive root systems. Sometimes a root barrier will help, and you will still be able to keep and enjoy the tree. A windstorm could cause large branches to crash into your home, crushing the roof or breaking a window. Even more serious is the chance of a tree being toppled, which could cause irreparable damage or even death to the residents inside the home at the time of the accident. Some trees have weak wood that is prone to attracting pests that can cause the tree to die, which increases your risk for a potentially dangerous situation to occur. Trees can cause the moisture in soil to fluctuate because of the water that is required to keep a tree alive. This can cause significant problems when the soil contracts and expands, which over time could put pressure on your foundation and cause cracks or shifting. When concrete settles, it is more likely to crack and shift. If the concrete in sidewalks near your home or in the cement foundation of your home has shifted, especially significantly, the structure of the home or the sidewalk could be affected. Residential foundations are especially prone to impaction, especially older homes. It’s common to see ceiling cracks, shrunk-in walls, and shifted support beams. Curb appeal for your home is part of the reason that makes it stand out as unique. Choosing the right tree to plant in your yard plays a big role in that. Not to mention, trees and mature landscaping can add significant value to your home, so when it comes time to sell it you will reap a greater return. It is important to accurately know the size of your yard and the size that the tree will grow to so that you can make the right decision on which species to plant. Smaller trees, including most conifers, Japanese maples, and crabapples can be planted closer to the home because their roots are not as aggressive and do not pose a risk in damaging the foundation. Contact one of our local arborists at Mr. Tree before planting a tree so you can be sure to plant the right tree in the right area. We are happy to provide our expertise and insight before you make your final decision, so contact us today.